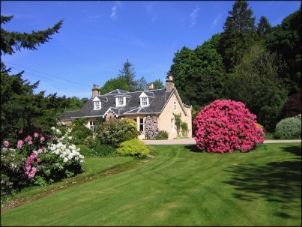 Finglen House, home to Sabrina and Douglas Campbell and their family for the past eighteen years, nestles at the foot of the spectacular Campsie Hills just 30 minutes to the north of Glasgow, 30 minutes from Stirling and 50 minutes from Edinburgh. Finglen enjoys an idyllic setting bordered on one side by the Fin Burn, home to herons, dippers. grey wagtail and mallard, and on the other by mature woodland. The beautiful eight acre garden and woodland gives a feeling of complete seclusion, rare for a property so close to Glasgow. You can walk from the back door onto open hills for up to eight hours or cycle from the end of the drive on dedicated cycle tracks to Edinburgh or Glasgow. The Accommodation comprises a lovely double bedroom with en suite bathroom both overlooking the Campsie Hills and another Double bedroom with adjoining private bathroom again overlooking the Campsie Hills and Garden. You are welcome to relax in the sitting room where you will find newspapers, magazines television and a log fire.